Most all modern indoor water faucets have a faucet aerator on the tip of the faucet. It's purpose is to limit the amount of water that flows from the faucet for the purpose of conservation and to allow for a steady stream of water. The aerator does this by adding air to the water flow. Remove the aerator and you'll find that the water comes out of the faucet in a forceful manner and ends up just splashing all over the sink. The low flow faucet aerator simply limits the flow of water even more without reducing the pressure. This of course, saves water and saves you money. Are Faucet Aerators A Standard Size? There are standard size faucet aerators to match the faucets commercially available. There are basically 3 different sizes of aerators. How Do You Measure A Faucet Aerator? The most important factor to know when measuring an aerator is the type of threading which indicates if you need a female or a male. If the faucet has threads on the outside (which means it's a male) then you need to purchase a female threaded aerator. Of course, if the faucet has threads on the inside (which means it's a female) then you would need a male threaded aerator. Then, you can look at the size of aerator you would need for your faucet. You can easily do this by placing either a quarter, a nickel or a dime over the aerator and see which coin the aerator is closest to in size. Do I Need A Faucet Aerator? As we said earlier, a faucet aerator really helps to increase the pressure of the water flowing out of the faucet, increases the streamlined flow of water and helps to conserve water as well. Without an aerator, your water would come out of the faucet in an unsteady flow, splashing all over the sink (and you) and you would just basically be using more water than you need to (and paying for it). 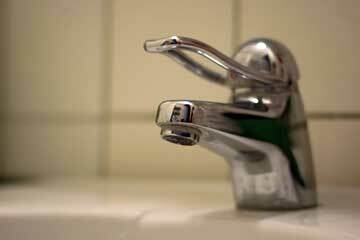 How Much Water Does A Low Flow Faucet Save? Typically, a low flow faucet aerator can reduce the amount of water by 30% or more. The important factor is that not only does it save water and save you money, but you won't be sacrificing anything. The water flow and pressure will not be compromised. If you have any questions or problems with your plumbing, call Atlantis Plumbing today at 770-505-8570. We are available 24 hours a day, 7 days a week.